Above: detail from the Ace of Spades showing the rose, thistle and shamrock. The Liverpool Daily Post was a local newspaper in the 19th and 20th centuries. It amalgamated with the Liverpool Mercury in 1904. It clearly had the appropriate printing machinery for producing playing cards, which are on good quality card and with intricately designed courts in full colour. 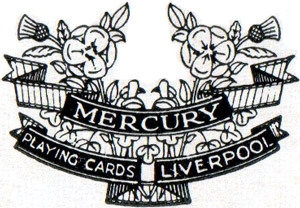 There seems to be only one pack, which was made for the Liverpool Cooperative Society, and was boxed as “Mercury” cards. This must be a reference to the former separate newspaper. 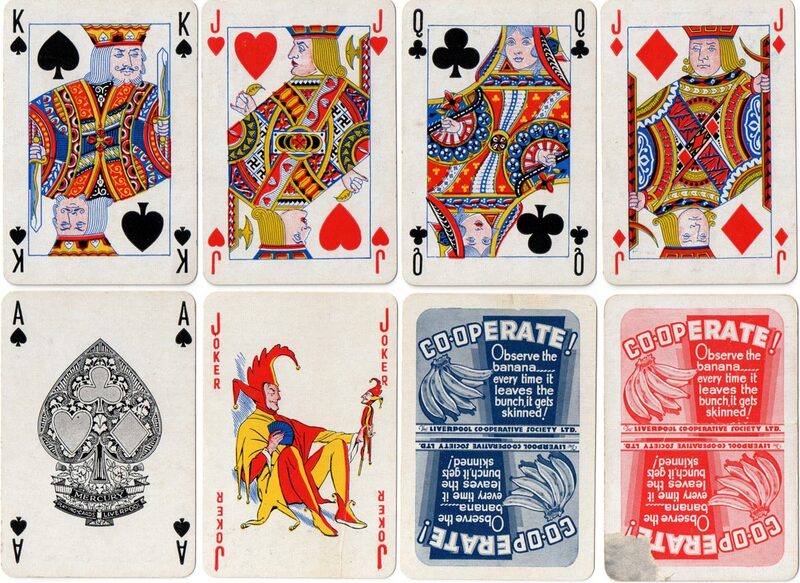 Above: “Mercury” playing cards produced for the Liverpool Cooperative Society printed by the Liverpool Daily Post, c.1930. 52 cards + Joker in plain box. There is no connection with CWS, Manchester, as far as is known. The Jack of Heart has swastikas in his clothing which at this time had no connotations with the National Socialist German Workers' Party.